There was a great deal of testimony on SB 2089 and SB 2129. As I mentioned in my prior posts, Texas Alliance for Life, the Texas Catholic Conference of Bishops, and the other "usual suspects" opposed these important reforms which would provide either a reprieve from the 10-day deadline or provide full due process rights which are now totally lacking. I'm going to provide you with some of that testimony here. Now, naturally, I do not agree with everything that Methodist has said here, but I am not going to get into that here. (As I have mentioned before, I am an appellate attorney working on the Dunn appeal and I'm not going to say any more than you see here for now.) You can read the Appellants' briefing here, they filed the initial brief on 2/22/18 and the Reply on 3/5/18. 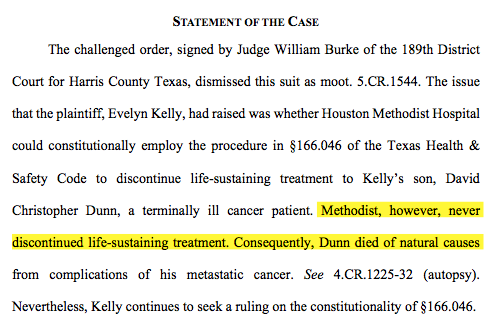 But the natural death admission (which was repeated at least 20 times in Methodist's Response brief) is crucial to this sort of legislative gamesmanship and rhetoric by the pro-TADA crowd who like to say, as Dr. Pojman did in his testimony above, that Chris died an unnatural death in the ICU or that patients whose life-sustaining care is maintained as they are dying is not a natural death. That's not what Methodist says. But that language and position tells you plenty about how lost they are on this issue. I'll also note that no doctor claimed his or her conscience was being pricked by continuing care to Chris Dunn. They also never formally diagnosed him. That diagnosis was completed by autopsy. In fact, let me point you to my prior post where I went through the entire case as it was up to that point, including how Methodist tried to obtain guardianship over Chris. Ms. Kelly mentions this in her testimony below. Finally, true to the playbook, Pojman argued that Evelyn Kelly wanted everything done under the sun to Chris medically and that that is what all of these families want. I've addressed that nonsense before here and so did Elizabeth Graham in her testimony that I embedded in my prior post. This was terribly painful for Ms. Kelly to endure. I was there, but she made that clear to everyone in the room. That apparently doesn't matter to the supporters of TADA. And, they do so support it, even as none of them could or did defend any due process in the statute in their briefing. They did not list how it complies with the basic due process required under the law. They did not because they could not. The term is mentioned twice in the Amici brief. Once on page 19 in quoting something the Appellants said in their brief and once on page 20 in addressing some case law. They focused on the mootness issue and avoided the merits of the due process argument entirely. As did Methodist. That is telling. My prior post, "Setting the Record Straight..." also addressed and showed how TAL, in its own written words, has come out in support of outright euthanasia. But you don't need me to tell you that. You can see that for yourself. I think he provides a very good summary here of the issues, the stakes, and who is really protecting life here and I want to end this series of posts with Rich's excellent testimony. I'm going to end my report about the testimony on pro-life bills heard on April 10, 2019, with a two-part series I'm calling "TADA Amendment Testimony: The Good, the Bad, and the Ugly." I want to start with the good. I want you to understand how others, experts in this area, see Texas' law. In my prior post about the TADA amendments (Texas Advance Directives Act; specifically at issue is Section 166.046), I said I was going to present the testimonies of Wesley J. Smith and Bobby Schindler, each of whom traveled from across the country to come give a few minutes of testimony to help Texas fix its mess. They think it's that important - not just for Texas, but nationally. Wesley Smith was "invited testimony" so he was allowed more time to testify when the bills were "begin laid out" earlier in the day. Please listen carefully to it. Note that he addresses this in a secular way and with recourse to bioethics. Note especially his poignant point that this life-sustaining care is not being stopped because it is not working; rather, it is being stopped because it is working. When he put it that way, I had one of those lightbulb moments. Yes, of course, that's the case. But the manner in which he stated it, made it so incredibly powerful. Take a moment and ponder that. Then think about it when I post Part II of this series. Smith notes that Texas has the weakest - worst - law with regard to patient protection and patient rights to make their own decisions in this matter. Other states have a two-way street in terms of the decision-making process. In Texas, as he noted, the patient has a right to refuse case, but if the patient wants care, he has no right to that if the doctor refuses. Again, ponder this when you get to Part II in this series and see what a supporter of TADA and opponent of these basic, common sense reforms has to say - and how he said it. Bobby Schindler also provided powerful testimony. He is, of course, the brother of Terri Schiavo who was starved to death over the course of nearly two weeks by her husband with the benefit of a court order. It's horrifying. It turned him into a patient advocate. A powerful one. He talks as one who works on these issues nationally. He sees how it is everywhere. Texas is the worst. "Pro-life" Texas is the worst, people! And, certain individuals, organizations, and clergy who call themselves pro-life support this law. It's just unfathomable to me and to many others (and, I'm happy to say to an increasing number of many others). Both Smith and Schindler have been very faithful in coming to Texas repeatedly to work on efforts to reform this law as well as to educate people about these issues. I am grateful to them as I know so many are. As a personal note, both have been among my pro-life heroes for many years. I met Schindler briefly in January at the Boots on the Ground conference, but we did not have much opportunity to speak. I got to speak with him at length on April 10. I am so grateful for his work nationally and internationally. It is so important. There is such a need. It was also a great treat to meet Wesley J. Smith. He is also an Orthodox convert and I'm grateful to him for his many years of clear, cogent writing on these issues. We need strong leadership and powerful writing and advocacy like his. Significantly, what did not happen here is that there were not dozens of families testifying about how great it was when TADA was used to pull their family members' plugs against their will. No affected person got up to say how that denial of due process was the highlight of their lives and how they hope others go through the same. All you had were the usual suspects testifying against these due process and patients' rights reform efforts: Texas Alliance for Life, Dr. Robert Fine, the Texas Catholic Conference of Bishops, the Texas Medical Association, the Texas Hospital Association, some Catholic hospital ethicist guy who works for Christus, an attorney for those who submitted the Amici Brief in support of Methodist Hospital, etc. In other words, those who are paid to support this law in some fashion or who benefit financially from it or its existence and those who - by the words they chose to describe their view of patients and, especially Catholic Church teaching - betray what can only be characterized as a euthanasia mentality and dehumanizing view of ill and disabled individuals. Finally, I have been remiss in not thanking both Senator Hughes for his authorship of SB 2089 (and to the co-sponsors Senator Hall and Senator Perry) as well as and Senator Creighton for his authorship of SB 2129. So far, there has not been a vote on these bills in the committee. I am prayerful and hopeful that that will change soon. I will keep you posted. The Texas Capitol. I took this from my room the night before the hearing. These are the two pro-life bills offered to significantly amend Sec. 166.046 of the Texas Advance Directives Act ("TADA") this session, each of which would make a big difference. I discuss them in my written testimony which I provide below the video of my oral testimony. The Senate Health & Human Services Committee took these up at the same time and allowed 3 minutes of testimony. I wanted to get this post up today with my testimony and that of Elizabeth Graham to set the stage for some future posts on the bills pending in the legislature right now that are truly pro-life. There are going to be additional posts on this subject in the very near future and we're going to get into more of the testimony offered for - and against - these bills. You can read the text of SB 2089 and follow its progress as with all legislation in Texas. In summary, SB 2089 would do away with the 10-day deadline. I've written at length why that it a problem, as has Texas Right to Life, as it describes how families basically begged the legislature to fix this. SB 2129 would completely rewrite the statute and actually insert due process there which does not currently exist. Let me be clear: there is not a modicum of due process in Sec. 166.046. Please do not confuse a "procedure" with "due process." They are not the same. Those who are so enamored of this statute will go on and on about the "process" that is in place in the statute. But it does not constitute "due process" which is a very specific legal term and has very specific legal requirements. Notably, no one has defended this alleged "due process" in the constitutional challenge in court (despite what a certain attorney for the Amici said under oath at the hearing), but more on that another day. The opponents of these bills, who are the proponents of this denial of due process that culminates in the hastened and premature death of a patient against his will, claim TADA provides a means of "dialogue" between health care providers and families. That's bull. It's a total lie. Anyone who has been in the crosshairs of TADA will tell you that. Anyone who has tried to render aid to someone in the crosshairs of TADA will tell you that. You can read the text of the existing law and see that there is no right for a patient or his surrogate to speak at the hearing, no right to representation, no right to an appeal, not even a right to an impartial tribunal free of conflicts of interest, among the many other due process protections that one should be entitled to when one's life is at stake. This is basic stuff. And vitally important. The people I am talking about, and doing my little part to support, want the diseases or whatever they suffer from (be it simply old age or a disability) in these situations to be the cause of their death, if they have to die at that point, and not to be killed through lack of ventilator, nutrition and hydration, etc. Now, again, as I have said before on this blog, there are situations where continuing care is actually doing more harm than good and is hastening the person's death. However, that is far more rare than what the proponents of euthanasia would have you believe. I've not run into a case of it any time I've been called. In Chris Dunn's case, he was conscious and begging for his life on video. (How do you explain the use of TADA on him? Well, I'm going to show you in a future post.) In two of the cases I worked on, the person was unconscious, but he was assimilating food and nutrition just fine. His lungs and kidneys weren't filling up with fluid, etc. There was no sign of distress. He was just unconscious and the doctors said he had no quality of life. I've blogged about that here before and you'll see it in my testimony below. Now let's look at that scenario a bit more closely: the patient who might make a full or partial recovery but who at the moment is critically ill. The classic example is one who is in a "coma" or "persistent vegetative state" or "brain dead." These are all inherently nebulous, vague, and ambiguous terms. They can mean, in many cases, whatever the doctor or hospital wants them to mean. The effect of their usage, however, is that rights start being taken away, then life-sustaining care or treatment, with the result of hastening a person's death against their or their surrogate's wishes, perhaps even denying that person a chance to fully or even partially recover. But they might recover and they need to be given time for a fuller evaluation to be made and for the body to have a chance to fully heal. If a doctor thinks it's pointless, transfer care. But they resist this. They fight it. They make it hard. The time ticks down and they pull the plug. That's wrong. That's where SB 2089 comes in. Second, before we get to my testimony, I want to address one more thing. A few who testified of their love of TADA slapped at Texas Right to Life for their opposition to it now when they are alleged to have supported it before. 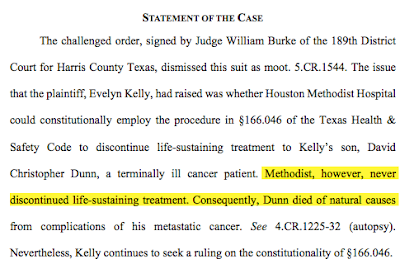 I addressed that in my epic post where I covered not just the Dunn case, but Texas Alliance for Life's admitted support of euthanasia, and the battle between it and Texas Right to Life. If you are new to the pro-life workings in Texas (or this blog), it would be worth your time to read it. It is also worth your time to listen to Executive Director of Texas Right to Life, Elizabeth Graham's, testimony addressing this (again). You need to know that others who may have initially supported this law in the beginning have come to regret that because whatever was intended, assuming arguendo that there was ever anything benevolent intended here by the doctors' and hospitals' lobbies, that is not what happened and that is not what goes on behind closed doors. We have to fix what is in this law and how it is used and be honest about those problems. Having some misguided loyalty (or worse) to a law you helped create 20 years ago that is a disaster only speaks to your issues but not to the realities of the law. Nor does that undermine or shine a negative light on the others who saw the error in the law and have worked tirelessly to fix it and help those affected by it. Those who attack Texas Right to Life on this point are wrong to do so. Their arguments are as unpersuasive as they are illogical, absurd, and, in some cases, based on outright lies (and I'm going to prove that to you soon). And, if Texas Right to Life is a little less likely to believe the medical lobby and those supporting the medical lobby, well, the old saying "Fool me once...." applies here in spades. I submit this written testimony in support of both SB 2129 and SB 2089. These bills reflect two efforts to reform a draconian and utterly unconstitutional statute that is at least two decades overdue. The current state of §166.046 and related provisions of the Texas Advance Directives Act (“TADA”), contain no patients’ rights protections whatsoever. There is no due process for the patient or his or her family, despite the fact that the end result of the exercise of TADA in this context results in withdrawal of his life-sustaining treatment (“LST”) against the patient’s will and hastens his unnatural death. I have been quite involved in the Chris Dunn appeal which is challenging the constitutionality of the law and am extremely aware of the flaws in it. Prior to this I have written and analyzed the provision extensively. Reform efforts to this shameful law have been nearly impossible for a variety of political reasons and those having to do with an inherent disregard – and even contempt – for the lives of those who are simply ill. Some are infants who are ill, disabled who are ill, or elderly who are ill. Some are severely injured. But their only crime is that they are ill or injured and a doctor has decided their lives are not worthy of receiving LST. Some will never be cured or be fully well again or as they were before, but they desire that their illnesses are what they die of – not a lack of LST withdrawn early to hasten their death. While much needs to be fixed in this law which is addressed in SB 2129 – and in the way society views the ill – addressing this the 10-day deadline as is done in SB 2089 and allowing more than 10 days – is meaningful reform which affirms life and the ability of people to make their own healthcare decisions without having their deaths hastened by the withdrawal of their LST. Due process requires, among other things, that the patient be given a right to be heard, be given proper notice of the hearing, be given an ability to prepare for it (by knowing what the reasons are for withdrawing care), be entitled to have representation at the hearing, that there be an impartial tribunal free of conflicts of interest, and that there be an appeals process. In this case, hospitals act under color of state law to exercise power reserved to the state to sentence patients to premature deaths. Section 166.046 gives hospitals the power to decide a patient is no longer worthy of life-sustaining treatment. This grant of authority allows even a private hospital, which is taking action under the statute, to performing a State function. The ability to take formal action which will result in death is not available to the public. Understanding how these decisions are made is critical to understanding why even a small reform can be so impactful, but also why an overall redrafting of the law is absolutely required to make it even remotely constitutional. After denial of one basic due process right after another – rights that even murder suspects and those convicted of murder receive – a patient can be involuntarily passively euthanized (by withdrawal of his LST, done expressly to hasten his death) in 10-days after the final decision is made by the hospital “ethics” committee. All that can be done now under the statute is to attempt to hastily find a new facility, but that is nearly impossible in this mere 10-day window. The ability to go to court for more time is difficult because the movant has to show “by a preponderance of the evidence, that there is a reasonable expectation that a physician or health care facility  will honor the patient’s directive will be found if the time extension is granted.” Sec. 166.046(g). That is the sole recourse to court that a patient or his family has. My experiences, and those of others, is that these decisions are not made because a doctor’s conscience is pricked by continuing care that he deems is causing the suffering of the patient. Moreover, removing care to alleviate suffering would be mercy killing which is prohibited by Sec. 166.050. The very definition of euthanasia, according to Merriam-Webster, is: “the act or practice of killing or permitting the death of hopelessly sick or injured individuals (such as persons or domestic animals) in a relatively painless way for reasons of mercy.” Thus, the law prohibits euthanasia on the one hand, yet permits that very thing on the other – and without due process and against the will of the patient or his family. And, it should go without saying that persons are not animals and should not be treated as such. But as you will see, that is exactly one doctor’s attitude about a patient in one ethics hearing I attended. If a doctor’s conscience actually should be pricked by continuing LST, and I have only heard that in the context of legal briefs (but not with supporting affidavits or evidence by doctors, just unsupported argument by counsel) and legislative committee hearings, but never in a hospital hearing, why not just move the patient or have another doctor in that facility provide care until transfer is completed? Why make moving him so hard and place obstacles in the way as so many hospitals do? Further, whether the patient actually is “suffering” or wishes to continue LST until his condition resolves itself one way or the other – naturally – while LST is continued, is a decision that the patient or his family or surrogate makes, not the doctor or hospital committee. He has the superior interest, as it is literally his life at stake. It is also worth noting that in the case challenging the constitutionality of this provision of TADA, that the hospital defendant has admitted that continuing LST allows the patient a “natural death.” In fact, one of the arguments that the hospital made is that it did nothing wrong and no rights were violated because the patient died a “natural death” when the hospital did not withdraw LST “voluntarily” but notably only after the lawsuit was filed. While the hospital is wrong about the nature of due process rights and how they manifest at every step of the procedure, it is a very important point for this committee to consider that maintaining LST for even a terminal patient allows that patient a natural death from his disease or injury rather than hastening it – rather than euthanizing him involuntarily and passively through the removal of his care. · “Man was not meant to be sedentary this long; if he were an animal in the wild and had been still this long, he would have been eaten.” Stated by the neurologist advocating for the termination of this patient’s care and life to the family of the patient. · “What we are saying is his quality of life will never change.” Primary doctor recommending termination. Because this person had a poor prognosis at becoming the person he was, according to the doctors who never knew him before he was ill, these doctors did not want to give more time. This is despite the family reporting seeing improvement, such as turning toward sounds, being startled when something fell and made a loud sound, and sobbing when the doctors discussed amputating his leg in front of him and his family. All of this was dismissed – illogically – as reflexes by the doctors who proceeded to make the comments above, among others. The main doctor – a neurologist – advocating for this man’s death likened him to an animal several times in front of the family. This is also despite the growing record of cases where patients recover from a PVS or comatose state years later. The brain can recover. It just needs time. The doctors also refused to consider less expensive in home care for the patient provided by a family member who was a trained ICU nurse. When the subject was broached, they were silent – they were unprepared for that. Then they all quickly said that was “not in the best interest of the family or the patient” without stating why except for resorting back to the “quality of life” mantra. Later, I was asked to attend another “ethics committee” meeting where the hospital was seeking to withdraw LST from a young man against his family's wishes. That family is here today to testify and I am grateful to them. The family had never heard of this law, were taken aback by what was happening to them, and could not believe that this was possible in America at all, let alone “pro-life” Texas. The family was unanimous and unified in their opposition to the withdrawal of LST for their loved one. It violated their religious beliefs, among others. I met with the family and we attended the hearing together. The family was allowed to speak and expressed – with medical literature – why they believed their loved one should not be killed by withdrawal of his LST. The two primary members of the committee dozed off repeatedly during the meeting, including the one who was chairing it. That's right. The two members of the committee most eager and vocal about withdrawing care to hasten a man's death against his family's wishes SLEPT during parts of the meeting while the family addressed them. THEY. SLEPT. It was abundantly clear that anyone who would dare oppose the hospital’s edict to kill a man prematurely by withdrawing his care enraged these members. Another one of the committee members, a doctor, asked what law we were even talking about. He was completely ignorant of the legal authority they were using even as he sat on the committee that would potentially render the final decision to kill a man. It was as if he was shocked that they even needed to have a law to allow them to make these determinations. That says so much. I have never been in a meeting with more blatant hostility and anger than this one toward a family, who remained calm and composed. Besides the lack of civility and kindness exhibited by these committee members, I was also appalled by the aforementioned doctor who was totally ignorant of the law. He was utterly confused by references to law at all. I had to explain to him that there was a statute and that that was why they could even have this meeting in the first place. Only two of the 12 or so there uttered a single kind, calm word; the two already mentioned two were hostile when they were not sleeping; one was ignorant of the law and confused; and the others were dead silent, avoided interaction with anyone, avoided eye contact, and/or looked bored or disinterested, if not annoyed by being there at all. When the family finished their presentation, not a single member asked a question. In another committee hearing I attended at this same hospital, one of the same members was there and again slept through parts of that hearing as well. I relay these experiences to make clear that TADA must be reformed. I would like to see it completely rewritten and compliant with every facet of due process – at a minimum, which is only right in as much as hospitals are using it to sentence people to premature and, admittedly, unnatural deaths. But I am wary of any law that would ultimately take someone’s life against their will. Understand also that the use of this provision of TADA is commonplace. Time is of the essence. If the committee cannot see to a full scale rewriting of the law under SB 2129, it should at least vote for SB 2089 and repeal the 10-day deadline to provide some sort of mitigation of what will still be an otherwise unconstitutional law as it will still lack due process for patients. The mitigation will be that the patient cannot have that final deprivation of due process – his unjust death sentence carried out. Let us all do what we can to establish as a matter of law that all life has value and needs to be protected, especially the most vulnerable among us. One of these days, that vulnerable person could be you or your loved one. It is not pro-life to hasten death by the withdrawal of LST against a patient or his family's wishes without due process and with a mere 10 days to find another facility. We err, if we err at all, on the side of life. Always. https://www.merriam-webster.com/dictionary/euthanasia (Last accessed 4/09/19) (Emphasis added). Those supporting patients' rights outnumbered those in favor of killing them against their will 9:1. Again, as I said in my prior post, those numbers matter. Two witnesses in particular, Bobby Schindler and Wesley J. Smith traveled across the country to give a few minutes of testimony to help Texas fix this mess because it's so important. I'm going to dedicate a blog post to them and what else we can take from that in the near future. So that's our second update about the big hearing and Pro-Life Activism Day last week. More in the very near future! NOTE: This was updated to correct the Senate Bill number and link to SB 2129. In two places, it was incorrectly written as SB 2191. I took this as we were leaving the Capitol Wednesday evening. The mockingbird called to me and stayed put while I took its photo. I'm preparing for my talk tonight at the University of North Texas in Denton hosted by the UNT Eagles for Life, but I wanted to put up a couple of quick posts with my oral and written testimony on the bills that were heard last Wednesday before the Senate Health & Human Services Committee as well as some other information. I have additional posts planned regarding last week, probably two or three more. Instead of doing some very long posts, I'm going to divide them up into groups of testimony by subject or theme. I want to start now, however, with the first pro-life bill we testified in favor of: the Preborn Non-Discrimination Act ("PreNDA"), Senate Bill 1033. You can read the text of the bill and follow its progress on Texas Legislature Online. I like this bill a great deal and think that it shows the humanity of all unborn, which we all so need to promote and help others understand. There are many exceptions to the 20-week abortion ban Texas put into place in 2015 and it amounts to nothing short of discrimination in many cases. That should not be. That's not pro-life. Importantly, the bill also provides some very real help for those facing such a pregnancy. I am always in favor of more information and more help to people facing any difficult situation and think we owe it to them. When I was working on my testimony at the hotel Tuesday night, I was in the business office trying to print my written testimony to submit. A man came in after midnight to do the same. I had a feeling he was "one of us." We started talking and he told me his story. Daniel Crawford and his wife, Kelly, faced such a pregnancy and carried their baby, Abel, to term knowing he was probably going to die soon thereafter. He did. But, as Daniel told me, "We loved him for 15 days before he went to be with our Lord." In the midst of that grief, they started an organization to help others facing similar circumstances, Abel Speaks. They were without much help, support, and information as they navigated their way through a devastating diagnosis. There is such beauty in what they did and in their testimony given before the Senate HHS Committee. The Crawfords were not alone. We heard from so many who did likewise. You can see the entirety of the testimony here. Some were given grim diagnoses and recommendations for abortion and their sweet babies are now sweet children. Some have disabilities, but all are loved and valued and were given every chance at life. No preborn baby deserves anything less. Families facing this situation need support not a quick recommendation for abortion and no other information. That doesn't honor the unborn child's humanity or the parents either. Texas Right to Life reported on the testimony as well. Also important to the discussion is that babies at this age can feel pain. They are human, after all. That they have potential or actual disabilities, health problems, or whatever, does not change this fact. Again, we have a 20-week abortion ban here but there are very broad exceptions. My friend, and roommate in Austin, Dr. Sheila Page, gave powerful testimony on this very fact. I always learn so much from her and have been blessed to listen to her and get to know her better since we first met in 2013. In my testimony, I wanted to focus on the discrimination aspect of this and how that mentality leads to euthanasia and overall disregard for all human life. (You'll note a theme among my posts lately. I am deeply disturbed and concerned about the way society views humanity and the effects and consequences of that.) I also wanted to point out how the failure to give women this information is not providing informed consent. There has always been a double standard here - even among feminists. I've heard feminists say, on the one hand, women are powerful and should be completely autonomous and decide who lives and who dies. Then they say, on the other hand, women are fragile and should not be given too much information lest they be scared away....from what? Abortion? Medical professionals sometimes oppose these bills and why would that be? In any other context it would be medical malpractice to perform a procedure on a person and not provide them the information they need for full and complete informed consent. Why the double standard? So they might not choose something else? Like life, maybe? I think the idea that pro-abortion people want fewer abortions becomes harder to believe sometimes just by listening to what they say. Anyway, we were only give two minutes, which is hardly enough time to say anything very useful, so many of us submitted written testimony as well. Mine follows the video of my oral testimony. I submit this written testimony in support of SB 1033. Among other things, this bill addresses two critical areas which demonstrate an inconsistency and hypocrisy in the law in the context of abortion which leads to a devaluing of all human life, including the preborn child and women, who are not provided the protection they deserve. First, it addresses ongoing legal discrimination against the most vulnerable segment of the population that is no less worthy of protection from such lethal discrimination in this case than anyone else. It closes the gaping loopholes in Texas’ existing law that allow for late-term abortion of a viable child even for nebulous reasons such as the “prevent[ing]…a substantial risk of serious impairment to the…mental health of the woman.” Second, it requires true and full informed consent on the part of the mother as to the preborn child’s actual condition and palliative care measures available should the worst case scenario be realized. This is information not currently offered. Society has an inherent disregard for – and, in some cases – actual contempt for certain human life deemed less worthy of dignity, protection, and the ability to continue living. For the preborn, we now see efforts to stop laws that would prevent rendering care even to those infants born alive despite an abortion attempt. This level of societal depravity must end and we in Texas can do something to roll this back. This bill is an important step in that direction. First, this bill addresses discrimination against the preborn. One of the last widely acceptable means of discrimination in our society, including among many who consider themselves “pro-life,” is that which is against preborn who may be ill, disabled, an undesired gender, and so forth. We also see this discrimination extended to those already born who are ill, the disabled who are ill, or simply the elderly who are ill and permitted (and even encouraged) by the laws in Texas allowing for the withdrawal of and refusal to provide healthcare to them as well. We’d not have one form of discrimination without the other. Not only does the current law allow for this discrimination against the preborn to continue, it actually encourages it based on the breadth of the reasons allowing late-term abortions of viable infants. The result of this legally sanctioned discrimination is the certain death of people whose lives are no less worthy of value, care, and protection than anyone else. The bill also specifically prohibits abortion based on discriminatory reasons such a gender, ethnicity, race, and the “probability of diagnosis of or having a disability of the woman’s unborn child” or by the “use of force or threat of force to intentionally injure or intimidate a person in order to coerce the performance or attempted performance of an abortion based” on these reasons. It would prevent abortions based on a non-life threatening disability or even suspected disability of the child and other discriminatory reasons and is based on existing anti-discrimination laws that hypocritically and inconsistently do not currently extend to the unborn. How can we expect any life to be valued if the least among us are routinely and easily discarded for the pettiest of reasons? Second, this bill addresses the lack of information given to women prior to an abortion which results in a medical procedure being performed without informed consent, something that would, in any other context, be violative of the law and medical ethics. The one area of “medicine” where is it permissible and encouraged to perform a procedure without obtaining fully informed consent is in the area of abortion. Indeed, both practitioners of this macabre procedure and lobbyists do everything they can to avoid fully informing a woman of the nature of the procedure, the true condition of her unborn baby and his or her state of development, the risks and complications of the abortion procedure, and the negative long-term consequences of undergoing such a procedure. Far from empowering a woman, proponents of abortion seek to keep her ignorant and push her into a something she may not have chosen had all the facts been given her beforehand. Under this bill, such a late-term abortion would be restricted to those preborn children who receive a diagnosis of a life-threatening disability but only after the mother receives information about perinatal palliative care which includes care from the moment of diagnosis to the delivery of the baby and possible death. This care includes not just medical care, but also social and mental health care, and counseling. The term “palliative care” also includes health care provided by maternal-fetal specialists, obstetricians, neonatologists, anesthesia specialists, clergy, social workers, and other individuals focused on alleviating fear and pain and ensuring the pregnant woman, her preborn child, and her family as a whole experience a supportive environment. The informational materials will also include information about services for the provision of this care and medical assistance benefits that may be available. Currently, an expectant mother receives a grim diagnosis and a recommendation to abort without any other information and without recommendations to other specialists to learn more about the diagnosis and a second opinion. Decisions are made hastily – and out of fear and even ignorance – because information is not made readily available to a woman. This is largely because the mindset of too many is that no child should be given the opportunity to be born with such a diagnosis and so the woman is “encouraged” to make a decision where certain death looks like the best and only option. Everything about the current system prevents informed consent and ensures discriminatory abortion under the law. In addition, this bill would restrict abortion also to only those cases where there is a medical emergency for the mother as that is defined in §171.002(3) “a life-threatening physical condition aggravated by, caused by, or arising from a pregnancy that, as certified by a physician, places the woman in danger of death or a serious risk of substantial impairment of a major bodily function unless an abortion is performed.” Truthfully, almost no abortion – especially a late-term abortion – would meet this definition because many times to the extent that the pregnancy itself is causing those risks, the post-viable preborn baby can be delivered prematurely and both the mother and baby receive medical care. Abortion is not healthcare and does not treat any medical condition. Killing a child at this stage does nothing to help the mother. Ending the pregnancy by delivering the child alive and treating both mother and baby helps everyone and affirms all life. This is life affirming legislation that this state needs for the sake of women, preborn children, and society as a whole. When society under color of law, targets the least among us as unworthy of life and disposable, how can we expect any life to be valued by the average person? No action occurs in a vacuum. These philosophies grow and spread and we see that in how society now views euthanasia and how Texas law treats the ill which we discuss today as well. We’d not be there without abortion. All life has value. And, if we are to err at all, we err on the side of life. Always. I will be posting more videos soon and discussing them. In the interim, you can see a number of them on my friend Yvette D's YouTube page. I really appreciate her taking the time to do this and sharing them with me. I am so grateful for all those who came out to support these bills. As Texas Right to Life reported, the support of the bill was overwhelming. It says a great deal about an organization and an issue when you get numbers like that. I'm going to be writing more about that in the future as well. Note that the companion bill to SB 1033, which is HB 2434, is being heard before the House Health & Human Services Committee Wednesday, that is, tomorrow. If you can get down there to register in support of the bill or testify in support of it, or both, please do so. It matters a great deal to show those who represent us what we want. Texas is not as pro-life as it could be. At the end of life, it is the worst. We're going to talk about that next. We can make a difference and the show of numbers matters to the difference we can make because those who lobby against these life-saving bills are quite monied and politically well-connected and influential. We have to make up the difference in numbers and hard work. So, that's our first update on the testimony. UPDATE: I should have mentioned that the bill was left pending in the Committee. At some point we hope that they will vote it out of the Committee so it can be taken up by the full Senate.